Israel's Beresheet spacecraft captured this selfie shortly before crashing into the moon's surface on April 11, 2019. Israel will keep shooting for the moon. The work on Beresheet 2.0 will begin immediately, he added: the team is meeting this weekend to start planning the new project. Kahn is president of SpaceIL, which built and operated Beresheet along with the company Israel Aerospace Industries. He also funded the mission to a large degree, covering about 40% of its total $100 million price tag. The 5-foot-tall (1.5 meters) Beresheet, whose name means "in the beginning" in Hebrew, launched to Earth orbit atop a SpaceX Falcon 9 rocket in February. The little robot spent the next six weeks pushing its orbit slowly outward, getting closer and closer to the moon. On April 4, Beresheet was captured by lunar gravity, making Israel just the seventh nation to put a probe in orbit around the moon. The touchdown attempt came a week later. Success would have granted Israel entry into an even more exclusive club; to date, only the Soviet Union, the United States and China have pulled off a soft lunar touchdown. And those missions were all government-funded. Beresheet was aiming to become the first privately funded craft ever to explore the moon's surface. But it wasn't to be. Beresheet suffered an engine glitch during its descent Thursday and slammed into the gray dirt at 310 mph (500 km/h). SpaceIL started out as an entrant in the Google Lunar X Prize, a $30 million competition designed to spur private space exploration. The GLXP ended last year without a winner, but SpaceIL keep working on its mission, as did several other teams. X Prize officials announced shortly after Thursday's crash that the Beresheet team will still get a special $1 million award. Beresheet's main goals were to advance Israel's space program and to generate excitement about science, technology, engineering and math among young people. 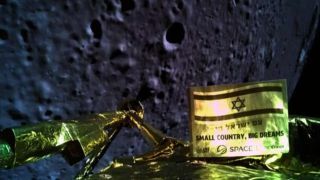 And the mission succeeded in both of these aims, even though it didn't nail the landing, Beresheet team members have said. Indeed, Kahn cited Beresheet's substantial global reach as a reason to try again. He decided to build Beresheet 2.0 "in light of all the support that I've got from all over the world, and the wonderful messages of support and encouragement and excitement," Kahn said in the video.